National Farmers' Day is a public holiday in the Republic of Ghana celebrated on the first Friday in December. It was instituted by the government in 1985 in response to a severe drought that had imposed serious burden on the country's farmers. The holiday honors Ghana's farmers and fishers and their contribution to the nation's socioeconomic development. Agriculture plays a significant role in the economy of Ghana. Since early 1980s, the government has invested significant funds in the rehabilitation and development of agriculture. 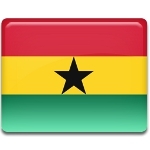 The main commercial crops produced in Ghana are cocoa, palm oil, rubber, cotton, tobacco, sugar cane, and kenaf. The main food crops are yams, cassava, and corn. Farmers' Day was established after the drought of 1983 in order to acknowledge the achievements of farmers and encourage the recovery of agriculture. The holiday is celebrated with a variety of events and activities, including (but not limited to) National Farmers Forum, exhibitions, awards ceremonies etc. The most distinguished farmers are awarded with special prizes for excellence in the use of new technology, husbandry practices, ecological awareness, and contributions to the local community.